You must be a member of the Malta Cinema and Theatre Group to attend this activity. Would you like to join this group? 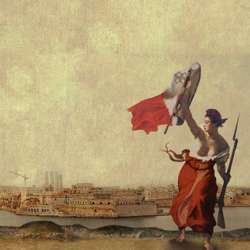 On the eve of INTERNATIONAL WOMEN’S DAY let's attend the WORLD PREMIERE of this Final Dramatic Curtail Call for the "Mother of Malta"
This is an innovative collaboration between theatre, film, visual arts and music, creating a stunning and thought-provoking exploration of contemporary Maltese political, social and feminist themes. This timely examination of political progress, dissent, and the search for justice draw on struggles against corruption, social tribalism, isolation and violence. The play is the story of a fictional Prime Minister of Malta, the first and only woman to hold the post. Her life story is also the story of Malta. History and fantasy are woven together with film, all set to the stunning music of Arvo Pärt.